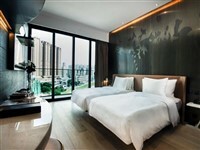 Want to find a new hotel in Macau, China? See our list of the latest openings of all the best hotels and resorts in China's casino city. The new Morpheus Hotel Macau opened in mid June 2018 offering 772 guest rooms and suites, as well as 9 ultra luxury villas (3 villas with private pool), featuring 24 hour butler service. This futuristic designed accommodation features a spa and salon, fitness club, rooftop open air swimming pool and a range of high-class food and beverage outlets. This new luxury hotel on the Cotai Strip in Macau opened in early 2018 and offers a wide range of accommodation with 1400 guest rooms, from standard rooms to large skylofts and mansions. The property features the large MGM Theatre, pool, gym and luxury spa, as well as a choice of high-end dining options. 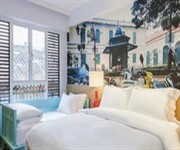 A new boutique hotel in Macau offering a good central location close to the tourist attractions of the city. The property has a total of 46 individually decorated guest rooms ranging from standard single room, to double, triple and family rooms. This "Old Hollywood glamour" inspired hotel, is a new luxury 5 star accommodation in Macau overlooking the Macau Jockey Club. Offering 368 guest rooms from Superior Rooms to Studio Suites and the Marilyn Suite, the property also offers an outdoor infinity pool, gym, restaurant, bar and lounge. This new 4 Star hotel in Macau is located in Fisherman's Wharf (close to the Macau Ferry Terminal) and was opened in early 2017. 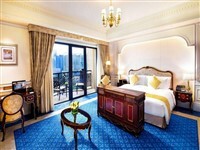 The property comprises of a total of 223 guest rooms and suites, many with fine views over the Pearl River. This large new 5 Star hotel opened in late 2016 offering 3,000 guest accommodations from 33 sqm Deluxe Rooms to 72 sqm Lyon Suites. This large resort features a half size Eiffel Tower, Aqua World, Qube Kingdom, Le SPA’tique, a 1,200-seat theatre (The Parisian Theatre) with live entertainment, swimming pool, health club and a wide choice of food and beverage outlets. A new luxury resort hotel in Macau opened in August 2016 offering a total of 1706 rooms, suites and villas. The property features a wide range of fine and casual dining venues, a spa, fitness centre, pool and the Performance Lake with its dancing fountains. 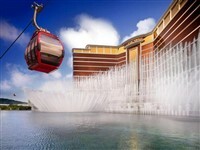 Please visit this page again to find the latest hotel openings in Macau for the coming year.